This attractive species of Pluteus appears to be widespread in northern and montane North America, where it favors the deadwood of conifers--especially that of spruces and eastern hemlock. When young the cap, gills, and stem are all white--and the surfaces are very finely granular-tomentose. 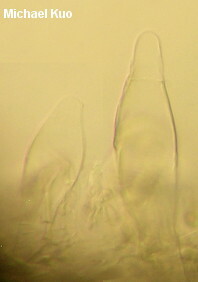 In age, Pluteus tomentosulus becomes more bald, and its gills become pink as the spores mature. 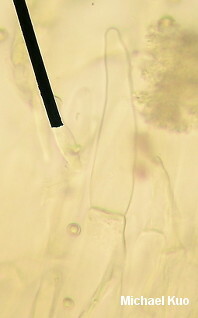 Distinctive microscopic features for Pluteus tomentosulus include its pileipellis (a cutis that lacks clamp connections), its cystidia (thin-walled and fusoid-ventricose), and its spores (broadly ellipsoid or subglobose). 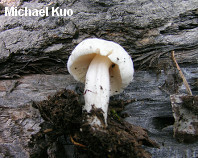 Ecology: Saprobic; growing alone, scattered, or gregariously on decaying logs of spruces, eastern hemlock, and other conifers (but occasionally reported on the wood of hardwoods, especially in the lower Appalachians); often appearing in low, wet areas; summer and fall; northern and montane North America. The illustrated and described collections are from Colorado and Québec. Cap: 3-6 cm; conico-convex at first, expanding to broadly bell-shaped; dry; when young finely granular-tomentose; white, sometimes developing pinkish hues near the margin; the margin faintly lined at maturity. 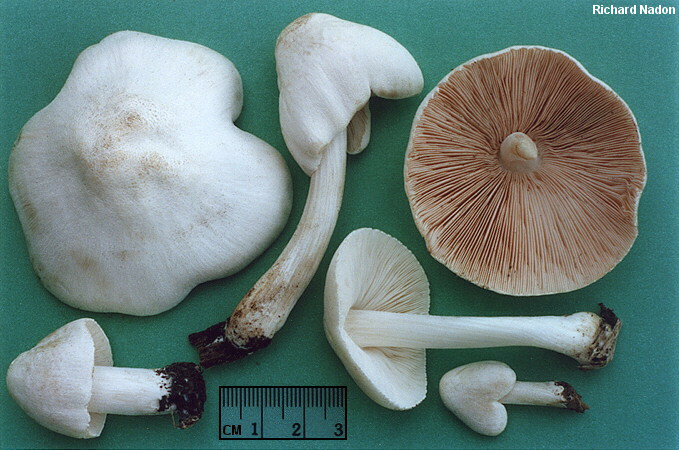 Gills: Free from the stem or nearly so; close; short-gills frequent; white at first, becoming brownish pink. 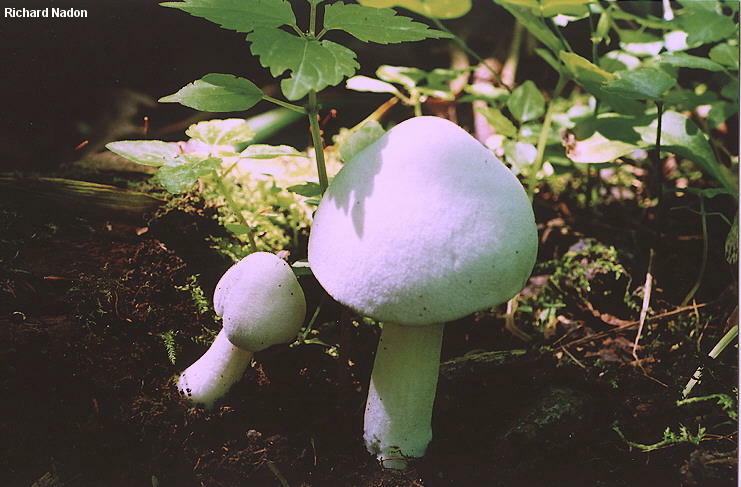 Stem: 4-7 cm long; up to 1 cm thick; tapering slightly to apex; base slightly swollen; finely granular-tomentose when fresh; often finely longitudinally grooved; white; basal mycelium white. Chemical Reactions: KOH negative to faintly yellowish on cap surface. 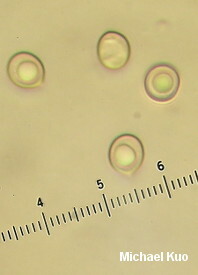 Microscopic Features: Spores 5.5-6.5 x 5-6 µ; broadly ellipsoid to subglobose; smooth; hyaline and uniguttulate in KOH; inamyloid. 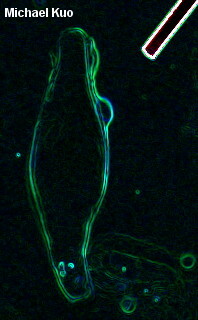 Pleurocystidia widely lageniform to subutriform, sometimes with a projecting neck; thin-walled; sometimes with a mucilaginous coating; hyaline in KOH; scattered; to 75 x 25 µ. Cheilocystidia lageniform; thin-walled; hyaline in KOH; abundant; 100-125 x 20-30 µ. Pileipellis a cutis; elements 5-15 µ wide, hyaline, smooth, septate, not clamped; terminal cells cylindric to fusiform. REFERENCES: Peck, 1885. (Kauffman, 1918; Singer, 1956; Smith, Smith & Weber, 1979; Barron, 1999.) Herb. Kuo 08200806.